The kingdom of heaven is like a mustard seed that someone took and sowed in his field; it is the smallest of seeds, but when it has grown it is the greatest of shrubs and becomes a tree, so that the birds of the air come and make nests in its branches. In 2016, PWS&D supported work in 21 countries. 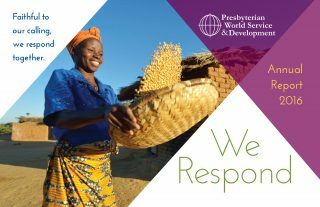 PWS&D’s 2016 Annual Report highlights the life-changing work our church is doing to bring about a sustainable, compassionate and just world. Jesus uses the parable of the mustard seed in Matthew 13 to describe how God can take a small thing and grow it into something much bigger. A seed is sowed. This small seed grows and grows and becomes large enough to nourish and sustain life. While it might at times feel like what is accomplished through PWS&D is a drop in the bucket of a world filled with need, the metaphor of the mustard seed shows us the massive potential in what is almost invisible—what seems small today will one day grow and thrive. Together, we plant seeds, water them, protect them and wait. Every mom that lives because she has adequate medical care during pregnancy, and very baby that survives their first five years are seeds sown for the future. A farmer who grows enough food to feed their family is a seed—ensuring a healthier, brighter future for themselves and their children. Seeds sown through PWS&D’s work with Canadian Foodgrains Bank and ACT Alliance to provide food, clean water, and shelter in times of conflict and disaster are growing to nourish life. Change starts not with earth-shattering gestures, but with small seeds—PWS&D donors, partners and projects—growing healthy, productive, safe and peaceful communities.